Designed by Conran and Partners, on a steep hillside site in Newcastle, the Quayside Lofts development incorporated an underground carpark above which is a landscaped roof garden forming a 'courtyard' between two residential blocks. Munro Associates were commissioned to design all the external soft landscaping on this challenging site. This included planting on the steep slopes beside the Tuthill Stairs and an 'intensive green roof' garden above the underground carparking. 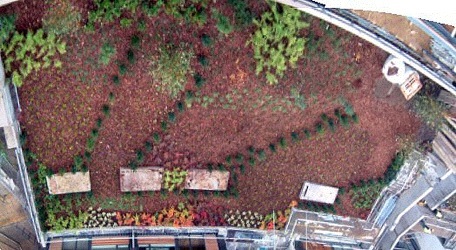 To reduce the weight on the carpark roof and also provide visual interest by creating a slight slope, EPS ballast was placed under the soil/growing medium and trees and large bushes were introduced along with smaller flowering plants to create year round interest.